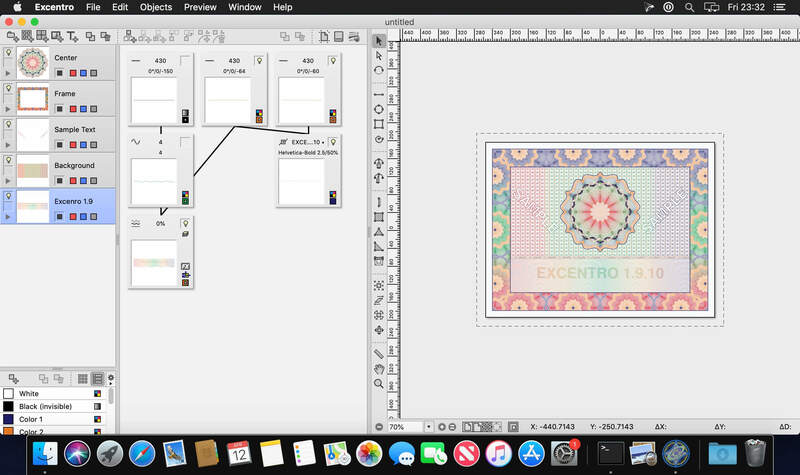 Excentro is an easy-to-use yet advanced tool that can create guilloche designs such as backgrounds, borders, or rosettes. The guilloches are vintage design elements that were frequently used for anti-counterfeiting security purposes on banknotes, passports, checks, and certificates over the past two hundred years. Even if today the main part of security technology lies in holograms, special papers or tricky inks, it is too early to say that the days of guilloche designs are over. They can still be used to prevent the counterfeiting of products that do not require the highest level of security (e.g., theater tickets, diplomas, or gift certificates). Or, they can just be used to decorate and add some aesthetic value to a product giving it a ‘money-like’ look and value.